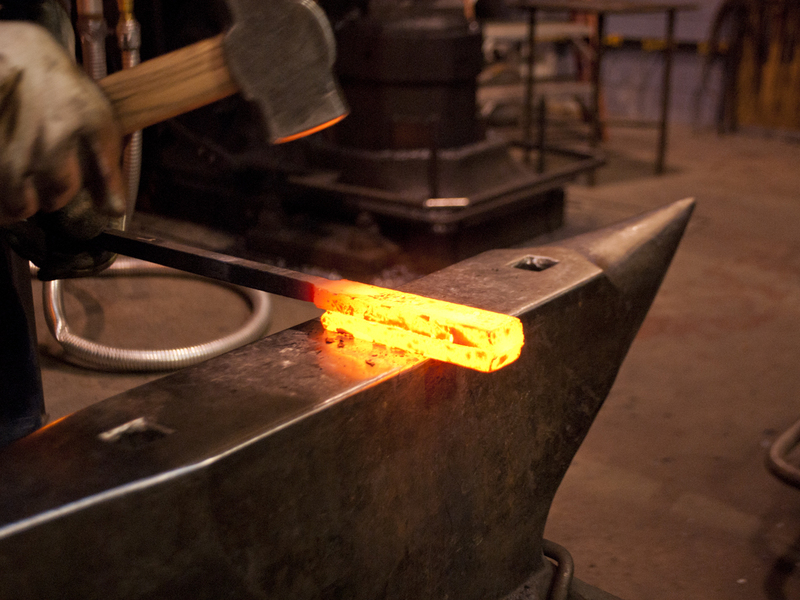 This year I will be teaching a class on the making and use of a common type of tool steel which was forged into tools and weapons in the Viking era. 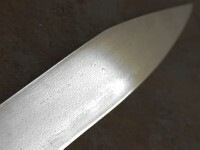 It is now often called “Shear Steel” to denote its high quality, i.e., suitable for demanding use in the blades of shears. 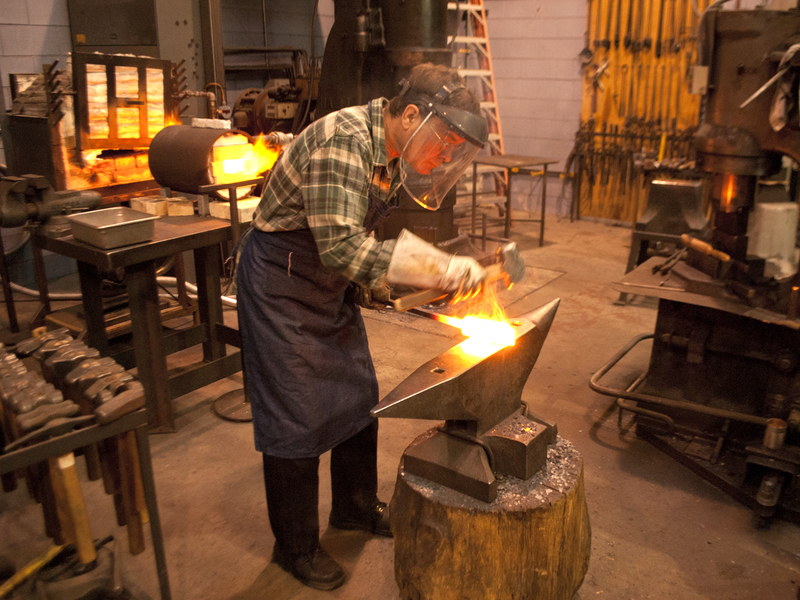 The process will give the students a fascinating look into the relationship between heat, carbon, iron and steel, which is the fundamental basis for the Iron Age. 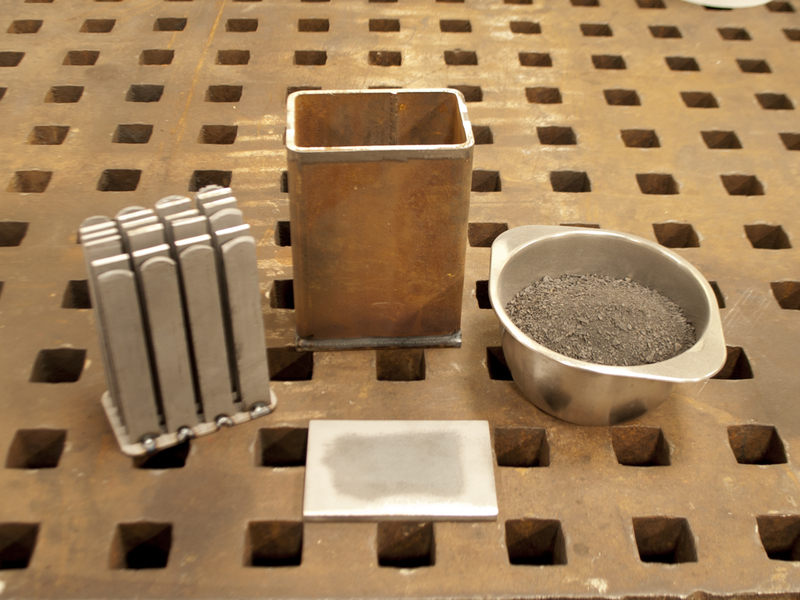 The material we produce will have all of the characteristics we would want in a simple, modern carbon steel except one – boring homogeneity. It will be very close to the the tool steel a Viking blacksmith would have been familiar with. One of its remarkable and historic qualities will be its watery, layered structure – not seen in any modern steel. 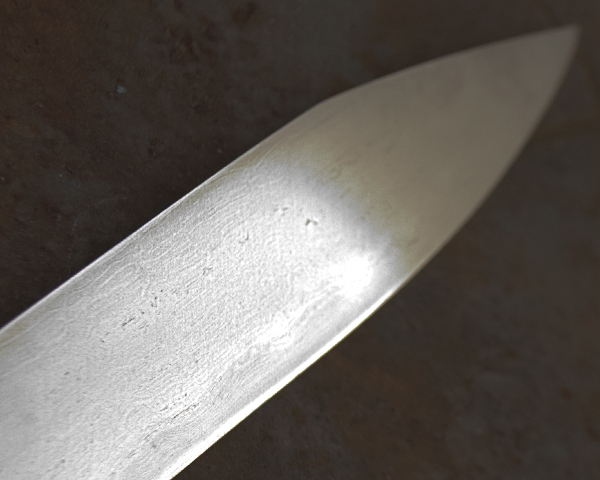 When welded into the blade of a tool or knife, then hardened and polished shear steel will have a beautiful grain like fine wood which is both decorative and evocative of the lively and earthy materials created and used by our ancestors. 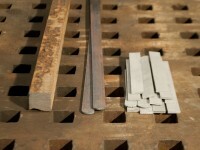 An old bar of wrought iron (left) is forged into flat strips (middle) which are then cut to equal lengths and sandblasted free of scale (right). 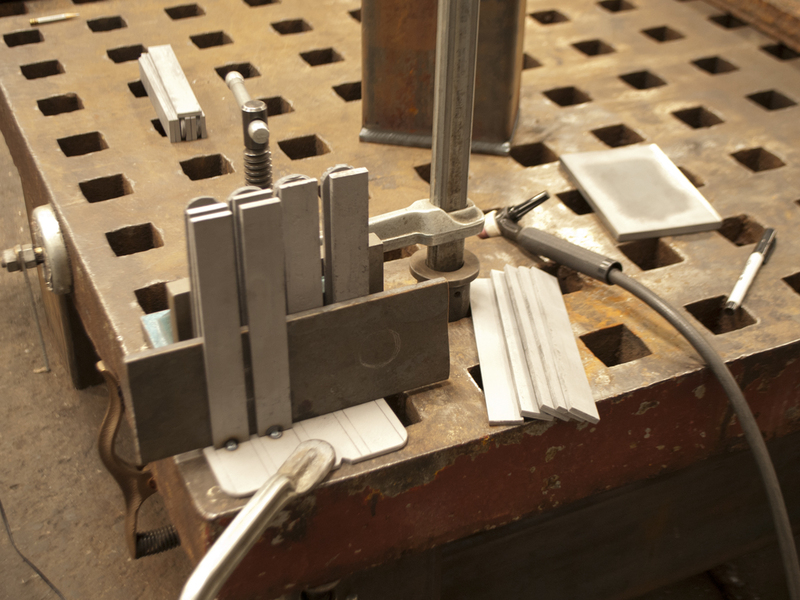 The strips are tack welded to a base plate which is sized to fit into a metal box. 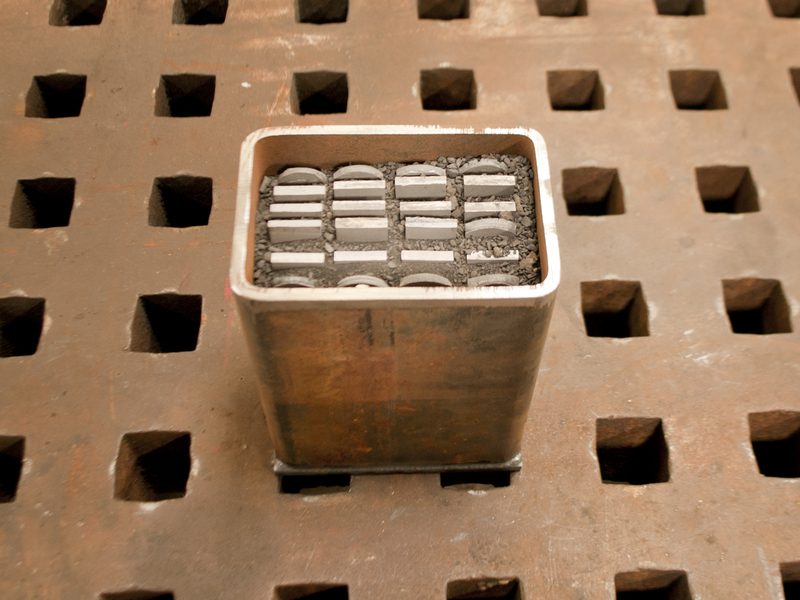 This keeps the strips spaced apart for the packing of charcoal dust. 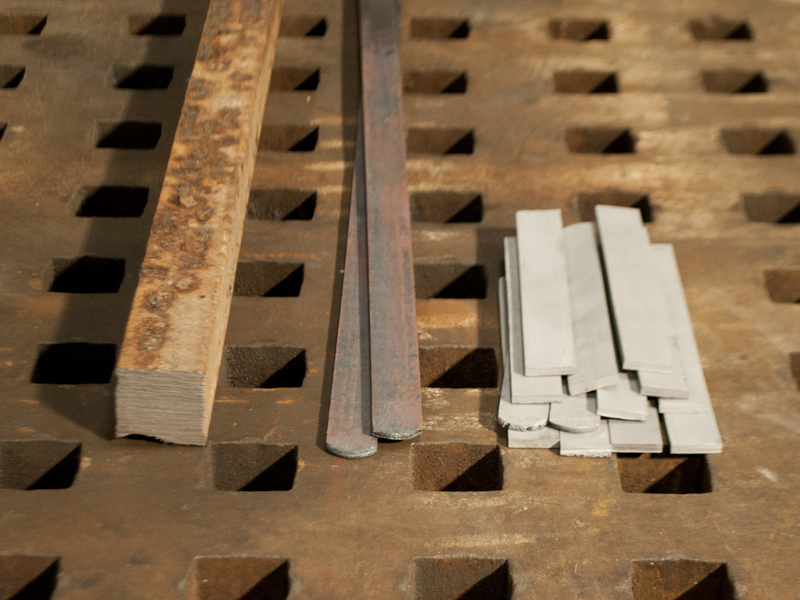 The wrought iron strip array, metal box, lid (front), and charcoal dust – ready for assembly. The packed box which will be densely topped off with charcoal dust so that the wrought iron strips are completely covered. 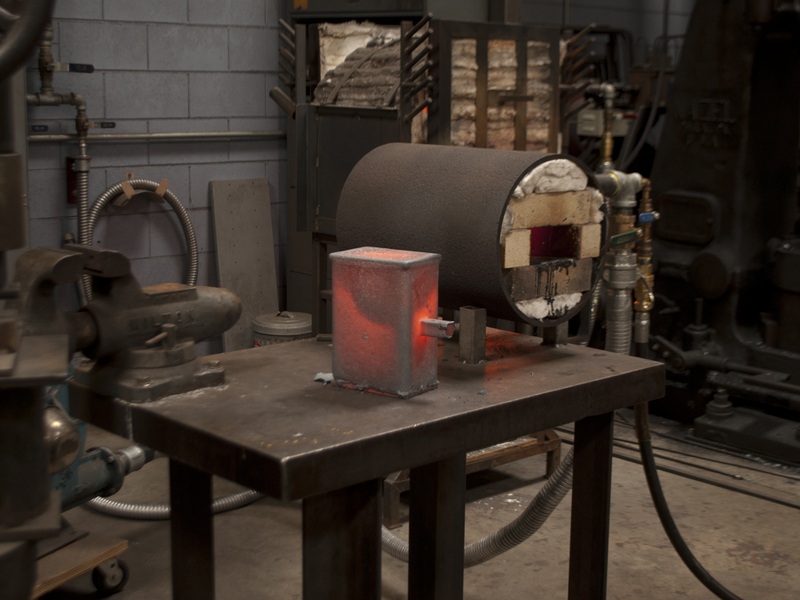 The box has its lid tacked on and is ready to be loaded into the furnace. 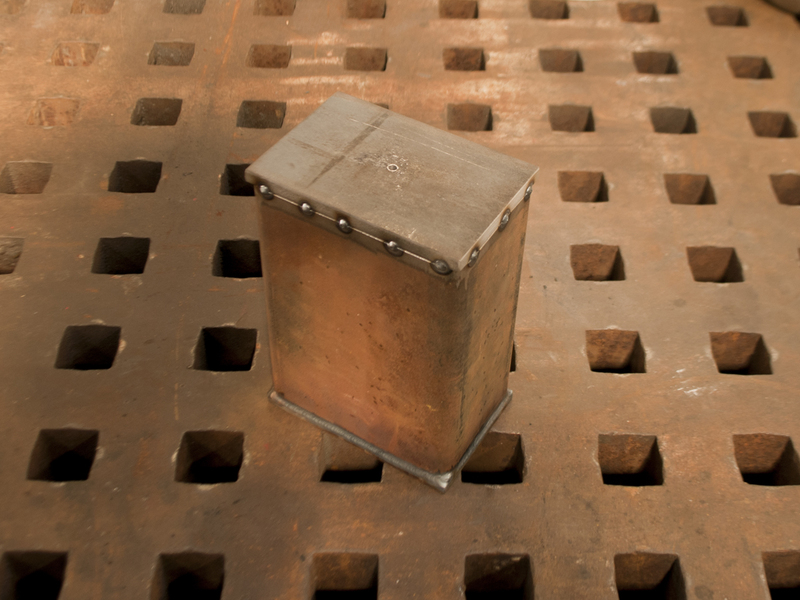 For safety’s sake the tacking is minimal so that the box cannot hold significant pressure. 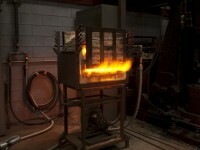 The charge is fired in the furnace for a period of about 4.5 hours at a temperature of about 2000 degrees Fahrenheit. Higher temperatures and longer times both lead to greater carbon uptake in the charge. It is easily possible to over-carburize the metal – even to the point of creating cast iron. The box is taken from the furnace and allowed to cool to room temperature for a day. It would be a huge mistake to open it while it was still warm since the charcoal dust would burst into flames – quite possibly creating a safety hazard and damaging the blister steel. The box acquires a heavy crust of iron oxide in the furnace and can only be used a time or two – even if constructed of heavy steel. 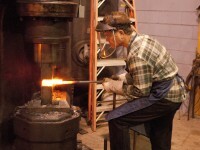 It is advisable to use tubing or plate steel which is 3/16″ thick for one use and 1/4″ thick or more for multiple uses. Thinner steel will oxidize completely through the wall and ruin the charge / create a fire hazard during the course of the severe firing conditions necessary to carburize the iron. 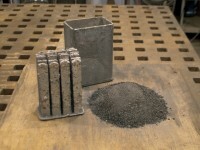 The blister steel and charcoal dust are retrieved from the box. 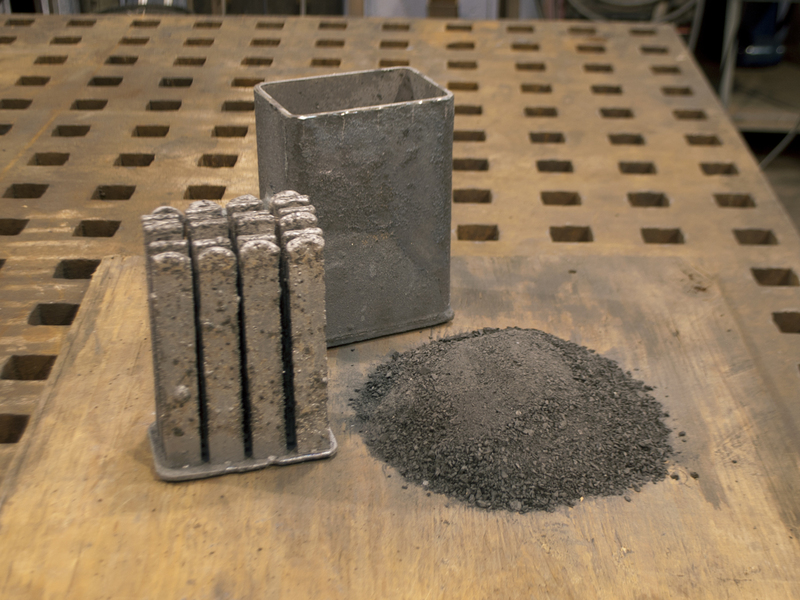 Strangely, the charcoal dust seems hardly to be affected by the firing process, aside from being slightly lighter gray in appearance due to its mineral content (white oxides of calcium, potassium, etc.). 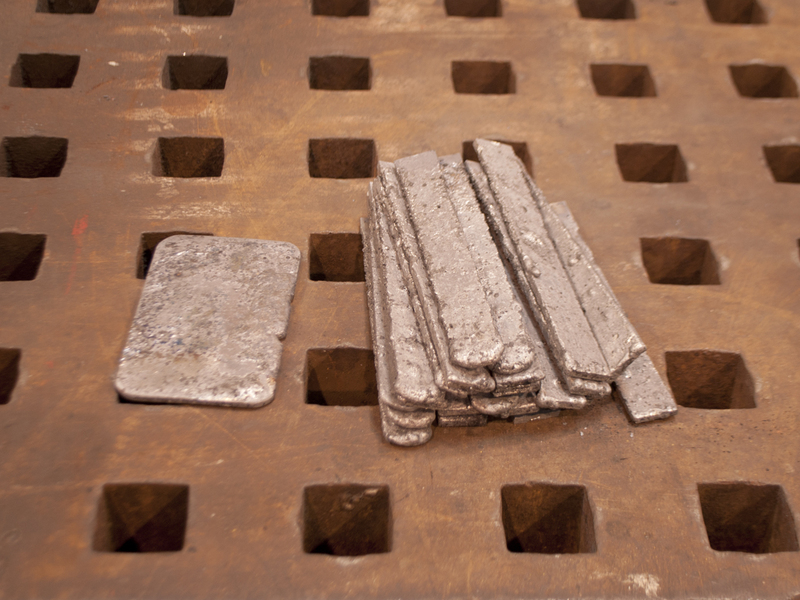 The blister steel looks shiny and irregular on the surface, with the characteristic blisters which give it it’s name. 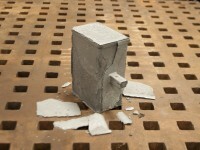 In this case the metal looks a bit over-carburized with its melted appearance. 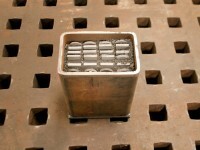 It will have to be folded together with some un-carburized wrought iron to balance out the carbon content. The charge of blister steel, along with the mild steel base plate. 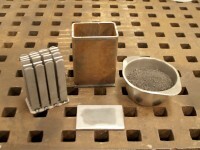 The base plate also gets a high carbon content during this process, and can be useful as such. 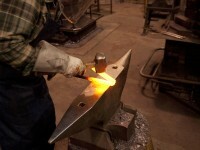 A small packet of blister steel is attached to a handle for welding and folding into shear steel. 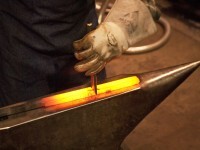 The blister steel is re-heated for welding. The first welding heat on the blister steel must be done very gently since the material has a very weak grain structure and is very brittle at first. 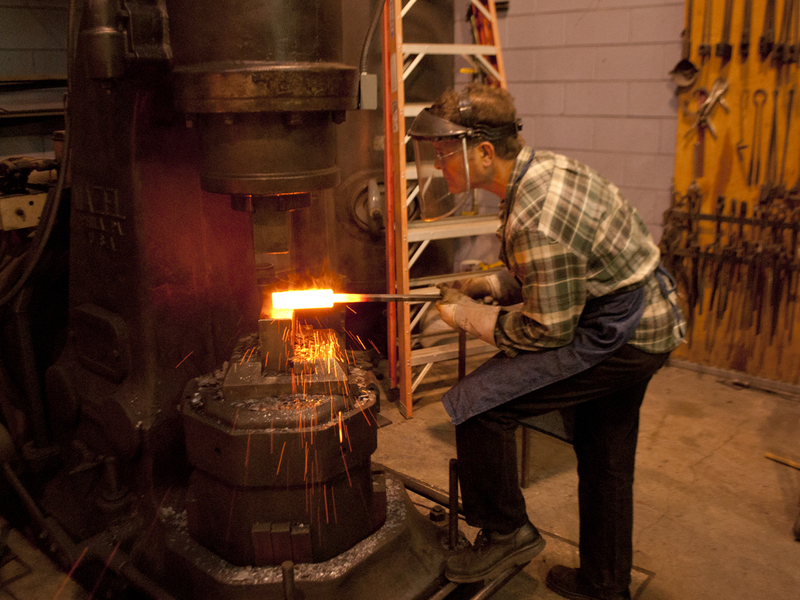 On the plus side, it is Very easy to weld together – quite a joy to work with! After some hand-welding the bar can be carefully worked on a power hammer. 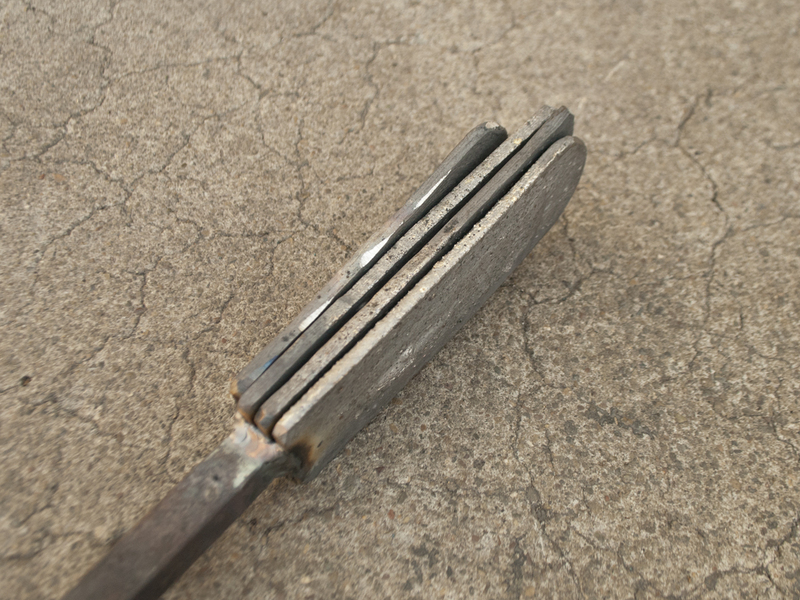 The new, raw shear steel is drawn into a bar for folding and layering. The bar is nicked for folding. 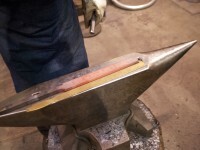 This is actually best done with a narrow fuller to help keep the bar from breaking during folding. The bar is re-welded, then drawn and folded several more times to get better grain structure and finer defect-distribution in the shear steel. This will give a higher-quality product. 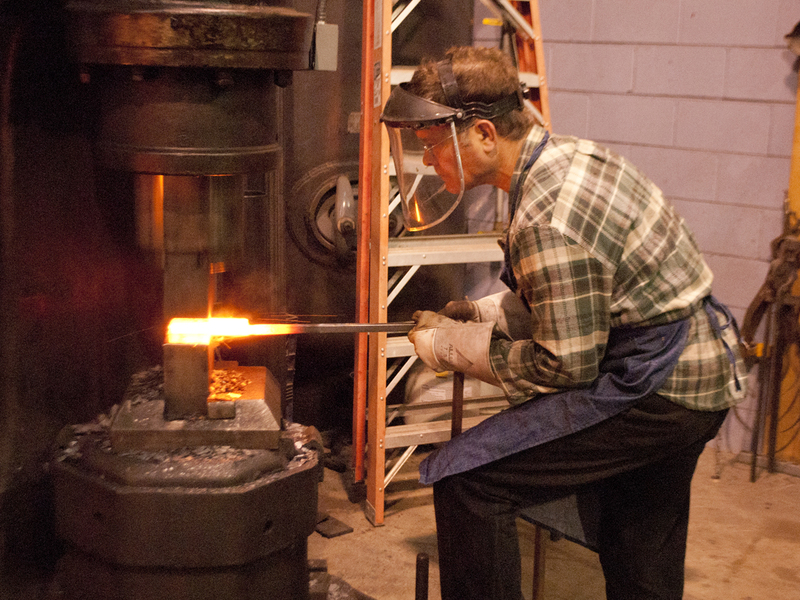 As the forging process progresses the shear steel quickly begins to behave like nice, high-carbon steel. It becomes tough yet malleable and can be worked on the power hammer like modern steel. 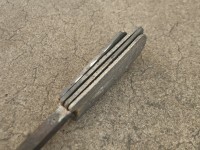 Shear steel as the cutting edge (lower edge) in a Viking style knife blade forged of fine wrought iron and shear steel. Posted	on Friday, December 16th, 2016 at 7:52 pm	under Axes & Straight Blades. Neat! Great post. 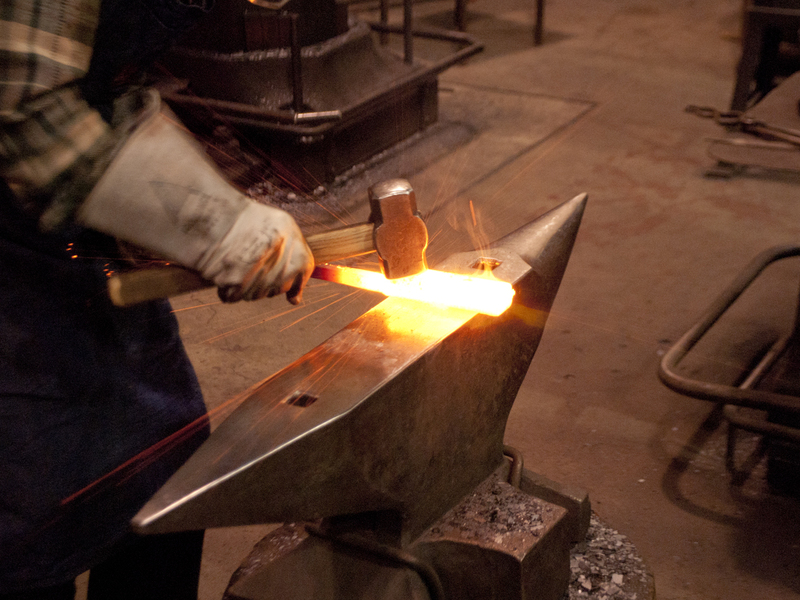 Love seeing how the folks back then forged their steel. Hey Jim…great series of pictures!!! Very well explained. Hi Shelley: The Viking tool steel class costs $325. 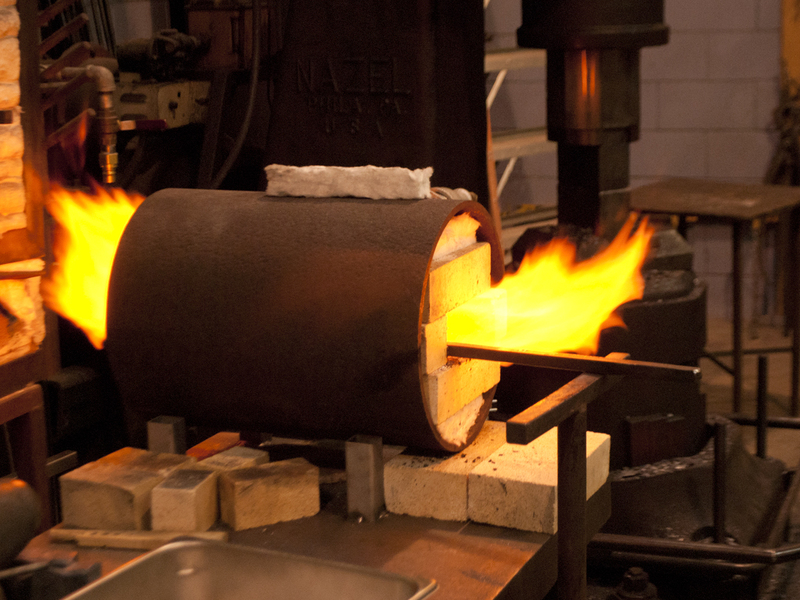 It runs on Saturday and Sunday, April 8th and 9th, from 10am to 6pm. Thanks for your and your son’s interest! Jim.